There have been some major changes sweeping through the United States lately, and one of them is legalisation of marijuana. The states of Maine, Massachusetts, Nevada and California voted to legalise recreational use of marijuana and Montana, North Dakota, Arkansas and Florida voted to legalise medical marijuana this month. Major media organizations are saying that this may be the start of a national trend. Advocates of marijuana reform are naturally optimistic, while those opposed to marijuana use are cautioning of the harms that marijuana reform can bring about. Though this number of states approving marijuana use together is unique, the foundation for it has been laid for some time. The overall trend in recent years has been that more and more people in the US support legalisation of marijuana use. The latest Gallup poll, for example indicated that 58% of Americans support legalisation. This percentage has been increasing for over 2 decades. The numbers are even more supportive among young adults, with 71% of 18-34-year-old population supporting legalisation. With the majority of the US supporting legalisation of marijuana, nationwide legalisation is a definite possibility. Marijuana may become more and more accessible with time, and use of it may increase also. The proponents of legalisation have different reasons for supporting it, including that incarceration of marijuana users will stop, that jobs and revenue will be generated through the legal marijuana market and many of these proponents definitely want marijuana legalised because they enjoy using it. While it is understandable that people who enjoy using marijuana want it legalised, the majority of people are not considering the spiritual aspects of marijuana use. 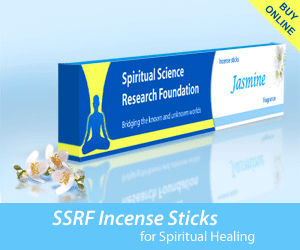 As per the spiritual research of SSRF, using marijuana or other intoxicants opens us up to attacks from negative energies from the subtle dimension. By making marijuana readily available, society becomes more vulnerable to attacks from negative energies. This makes it easier for negative energies to influence us in various ways to the detriment of society. In addition, people who enjoy using marijuana are doing so to either experience happiness from it or to escape the sorrows they face in life. It is human nature to seek happiness and avoid unhappiness, but by doing spiritual practice we can experience a far higher form of happiness. This experience is called Bliss, which is not dependent on anything external as it comes from within. Also, although using marijuana may provide a temporary escape from difficulties in life, eventually we must still face these difficulties. Seekers who have used marijuana before starting spiritual practice have found that by doing spiritual practice for some time the desire to use marijuana went away naturally. This happened because they were far more fulfilled from the Bliss they experienced through spiritual practice and they realized that spiritual practice gave them the tools to go through life’s situations with a positive outlook. The spiritual purpose of life is to progressively move beyond the happiness and sorrow we experience in the world and merge with God. Spiritual experiences beyond the 5 senses, mind and intellect such as Bliss draw us closer to this goal, while attachment to worldly happiness draws us away from it. The happiness one feels from marijuana use is also dependent on the 5 senses, mind and intellect, so it draws us away from our spiritual purpose. Based on the above, if society were to understand the spiritual purpose of life, then the question of legalisation of marijuana would not even arise because people would do spiritual practice and have no desire to use it. Doing spiritual practice helps us to understand what is truly in our best interest, and it enables us to make positive decisions that help us and others around us. I encourage those of you not doing spiritual practice to read the links below to start so you can experience Bliss and experience the benefits of spiritual practice firsthand. We can see why legislation on various items from drugs, cars and modern weapons especially in the United States fail. The source of drug and weapons violence in the United States consist of most of its causes in the spiritual realm. If the United States can counter car accidents and gun violence with spiritual remedies.Subsequently there’ll be a drastic reduction in violence without sacrificed freedoms like other countries. A perfect idea is to establish rehabilitation centers instead of prisons. They are designed to promote Spiritual growth of criminals then maybe there’s no need to resort to the insanity of proving to fail control measures. Regulating drugs physically have proved ineffective during the Prohibition Era in the United States. We need personality defect control. We need spiritual control. And, it won’t resort to restricting people’s travel and their personal property. Unfortunately, other countries like the former USSR did not follow it and innocent people were hurt either directly or indirectly. Personality defects are the problem. Not the drugs, not the weapons, not the system. Its the spiritual level! It’s the psychological! Systems fail not because of the system. They fail because of the personality defects of politicians and other oligarch type organizations. God has established the system per Humanity’s destiny. He was gracious to extend the right to free will, but we have misused it especially in the United States. By God’s grace America defeated a tyrant filled with personality defects. It was God’s wish for the United States to be a shining example in freedom, but God shall judge the spiritual misdeeds. We have abused our God given rights for the promotion of a tamasik lifestyle that denigrates the sattvik people with the price of disregarding their rights wrongfully. One person abuses medical drugs and a seeker is negatively effected with. Sure the seeker obtains divine grace to reduce the effect of the wrongdoing; but it still traps society in a karmic cycle. I have been going to satsangs but out of my own personality defects combined with spiritual distress have I neglected. But, I will go to satsang on Saturday. The medium distress from the super lunar moon eclipse and New Years have faded. Thanks for sharing such spiritual artical with great research background. Thank-you for this interesting article regarding the relationship between marijuana use and it’s spiritual affects. While not a user myself for a very long time, I was not cognizant that it’s use opened one to negative energy. Would an example of the negative energy effect be the sensation of paranoia? Yes, sensation of paranoia can be one of the negative effects, among many others. If you are interested to read about various ways negative energies are affecting society, we recommend this article. legalisation of drugs that are currently illegal has been proven to decrease usage amongst large populations. When legalised the criminal element is removed from the supply lines and the quality and use can be better monitored and controlled. The USA has more people incarcerated in prisons than any other country by a wide margin. Most of those “prisoners” are accused of marijuana related offences known as victimless crime. These prisoners make up more than 70% of private prison inmate populations and they are used for slave labour to manufacture weapons for large corporations such as Raytheon, Lockheed Martin and other military contractors. Marijuana offenders are the preferred workers within private prisons as they are trustworthy and dependable workers. While I do not condone the use of marijuana it does have significant medical advantages over many legal prescription drugs. Marijuana can be very effective in alleviating numerous medical conditions without the nasty side-effects caused by most synthetic prescription drugs. There has never been a recorded death due to marijuana overdose. However, the drugs that are currently legal in society which include alcohol and prescription pain killers do kill many thousands of people per year, every year. In the Divine kingdom nobody would take any drugs but we aren’t there yet. Perhaps if marijuana is legalised the abuse of alcohol and other pain killing drugs would decrease and hence benefit society? Do I support legalisation of marijuana, of course I do based on the fact it is a far safer and more effective alternative than many medical drugs sold legally today. Would I use it for recreational use, no. Recreational use is an educational issue and should never have been a legal issue. It became a legal issue about 60 years ago because large corporations peddling synthetic alternatives wanted to remove the competition and had marijuana listed as a schedule 1 substance. What you have shared is from social point of view and some medical view, where our blog is purely from spiritual point of view. Other points you shared about negative effect of alcohol and some legal drugs is also covered in our different articles. From this blog we can learn the importance of spiritual practice in our life. We kindly suggest you to read articles recommended at the end of the blog and to start your spiritual journey in order to experience beauty and benefit that spiritual practice can give us.